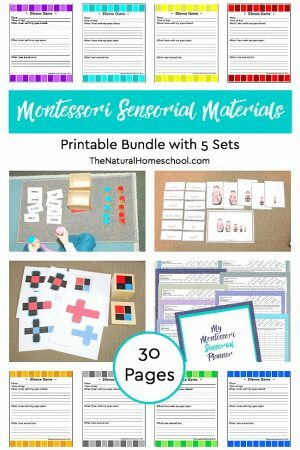 Have you heard about the Montessori Sensorial materials? They appeal to the senses in eight different ways: Visual (eyes), Olfactory (nose), Auditory (ears), Gustatory (mouth), Tactile (touch), Stereognostic (muscle memory), Baric (weight and pressure), Thermic (temperature). 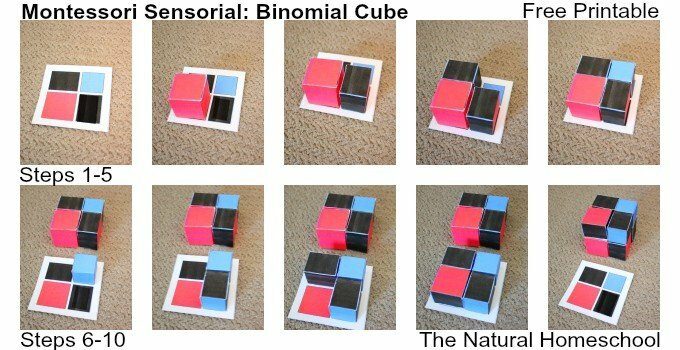 In this post, I am introducing the Binomial Cube, which is a visual and tactile work. 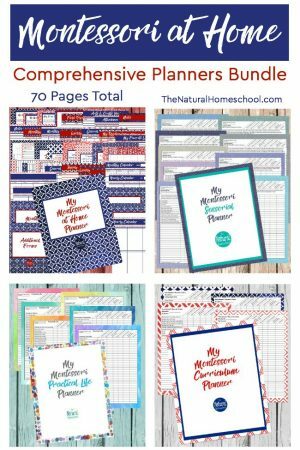 You will see a step-by-step presentation and even a free printable for you! I hope you enjoy it as much as we do! It is our favorite work right now. 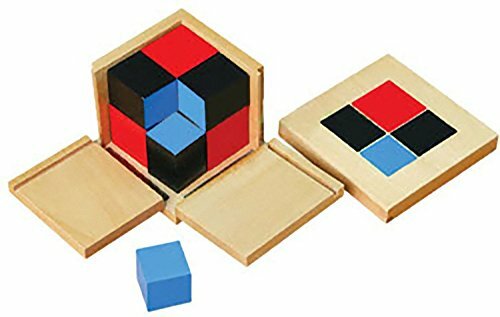 The Binomial Cube consists of eight pieces: one red cube, three red and black prisms, three blue and black prisms and one blue cube. There are two levels to building the Binomial Cube. Click on the image below for more information. 1. 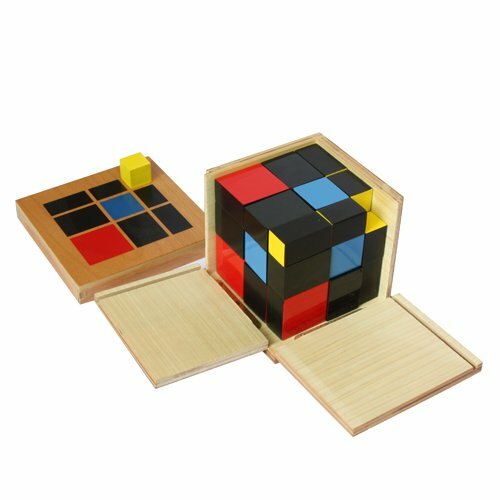 The child gets the binomial cube from the shelf and places it in front of him/her on a table or on a mat (on the floor). 2. Slowly, take the binomial cube apart, piece by piece. Set them on two columns. One column has all the prisms with red and red cube. The second column has all the prisms with blue as well as the blue cube. 4. For the first layer, start with the red cube. Place it on the red square. On either side of the red square, there are black rectangles. 5. Take a prism with red and black. Turn it sideways so that the red side touches the red cube and the black sits on the black rectangle on the lid. Do the same with the other red and black prism and place on the second open side on the red cube. 6. The only spot left open is the one with black on either side and blue on the lid. Take one prism with blue and black and place it vertically there. 7. The first layer is done! Take it and slowly place the first layer in the box. 8. For the second layer, start with the blue cube and place it on the lid. On either side of the blue cube, you will see a black rectangle on the lid. 9. Take one black and blue prism and turn it sideways so that blue touches blue and black touches black. 10. There is one spot left on the lid and that is a red square. The red and black prism goes there because the red touches the red and the black touches the black. 11. The second layer is done! Slowly, move that layer from the lid and place it on top of the first layer. 12. Close the box and place the lid back on the box. An extension is to build the cube using a blindfold. Direct objective: To effectively build the binomial cube. Indirect objective: An introduction to algebra. Ages: It is recommended to start at 3 years of age, but I started a few months early with both of my children. 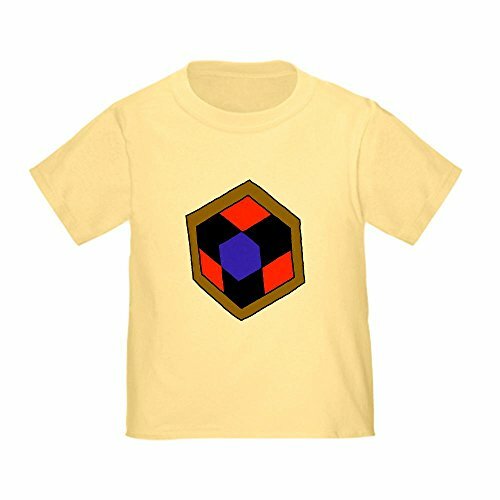 I did find that the binomial cube interest has peaked at 3 and 5 years of age. I have made a free printable of the binomial cube for you to use. 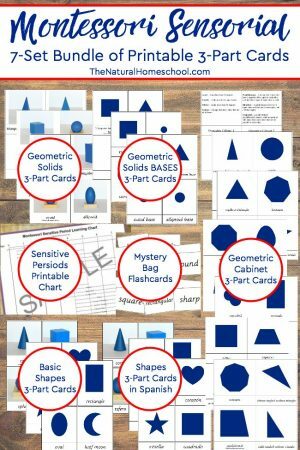 You can always buy the classic Montessori Binomial Cube, but I made this free printable as an option for those that are frugal and want to try it out before buying. 1. 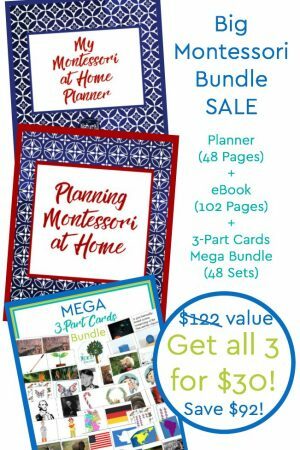 Print the set once in color on white cardstock and then page 2 is printed twice. 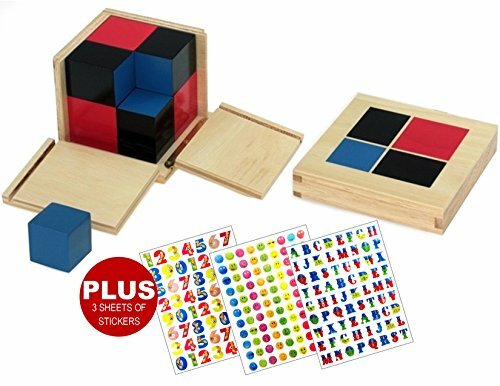 Make sure you have printed the lid, one red cube, one blue cube, three red and black prisms and three blue and black prisms. 2. Cut the lid, the 2 cubes and the 6 prisms. 3. Use tacky glue to put the cubes together. I do not recommend glue sticks or white glue. 4. 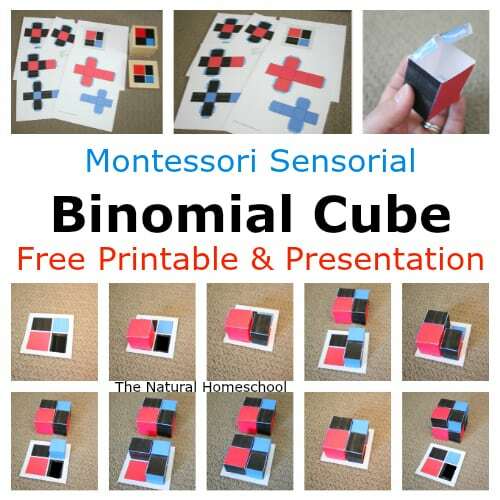 Have fun following the presentation steps (above) to build the binomial cube. 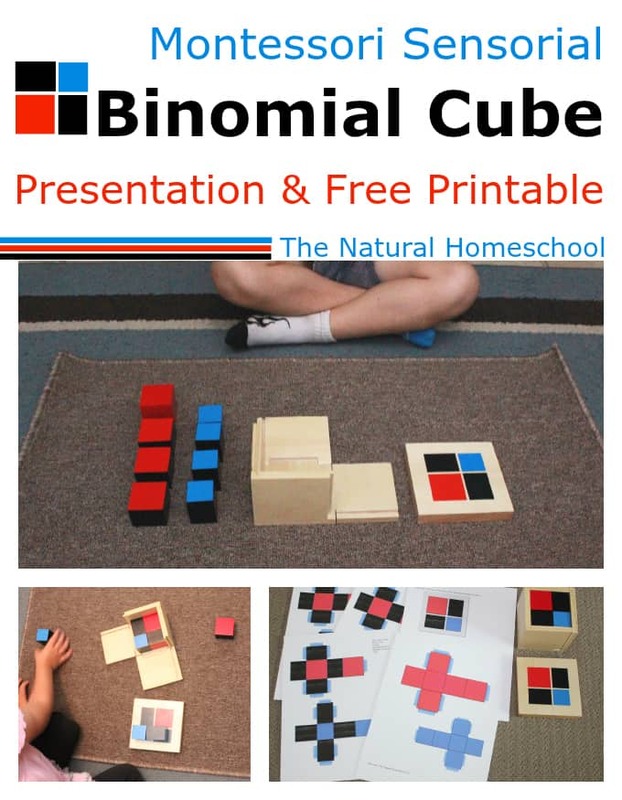 Get your FREE Printable Binomial Cube Set here. Click on the image to see what one of the extensions will be when the child is ready for more. 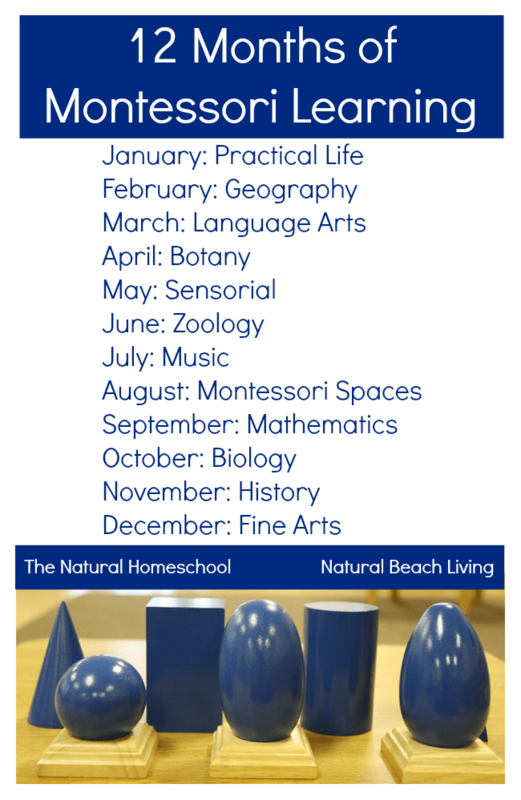 Come visit more posts about Montessori Sensorial! Oh wow, LOVE THE PRINTABLE!! It looks totally awesome! SHARING!! The binomal cube is one of my favorite materials and you certainly did it justice. I love the free printable. That is brilliant! Yehey! Thank you for creating this. Answered my curiosity about this material. 🙂 Love it! Will use your printable when I have decided to get one. Thank you! So glad you enjoyed this post! Does anyone know why the second page won’t print for me? The first and last pages print fine, but the second one always comes out blank.